This project came about very slowly and, at times, uncertainly since the guidelines were so broad. It began with a small idea of a system of exchange of apples. After I began thinking about the storyworld itself, I resorted to the conflict revolving around a dispute of interests between neighbors. 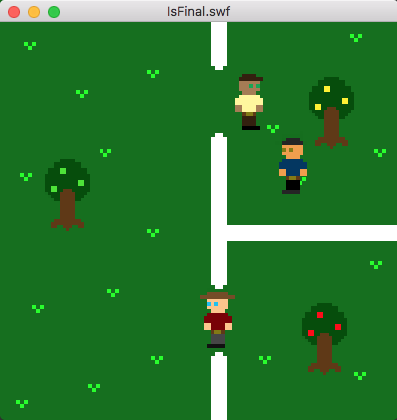 I then decided to have each of the three characters be the owner of a tree and of an area. Each character only had access to their said tree and had to work alongside another character to be able to have access to a different kind of apple. The overall project ended up being an interchange of interactions between neighbors in an attempt for each of the characters to get what they want. The concept of the storyworld is a simple one: each character has a certain preference for one of the three kinds of apples. They will gladly receive their preferred kind of apple, accept the kind of apple they’re indifferent about, and disregard the kind of apple they do not like. For the purpose of this storyworld, everyone’s top kind of apple is the red apple, so everyone wants to obtain the red apple. However their second preference in apples vary. The apples represent the objectives, and the themes are the effort of working together with other’s that we must learn to live with. Setting: a piece of land that is subdivided into three sections by white fencing, one for each neighbor, which each contain an apple tree of a different variety. User Character: He wears a brown baseball cap, trousers, and a light yellow colored T-shirt. The user character wants only to get to the red apples and can either enlist the help of his neighbors or anger them against him. NPC #1: He wears a black beanie, trousers, and a blue colored T-shirt. This NPC wants red apples, but is willing to accept green apples, he can either aid or harm the progress of the User Character depending on the User’s interactions with both NPCs. NPC #2: He wears a brown cowboy hat, trousers, and a red colored T-shirt. This NPC wants red apples, but is willing to accept yellow apples, which belong to the first NPC. He is very set on protecting his land and red apple tree and is highly uncooperative. Getting him to do what the user wants will prove challenging and not necessarily mean that the NPC was willing to help. With these options they are able to unlock more options and actions in the world. The resolutions are being able to get each character what they want, which is the red apples, getting the apples only for the user and the first NPC, for the user and the second NPC, or simply getting what the user wants for themselves. The conclusions vary with making anywhere from none to all of the NPCs helpful, or angry towards the user and it all depends on the user’s decisions and interactions throughout the scenario. Trees: They give off infinite amounts of the color of apple that is assigned to them. They can be harvested off of. Apples: Each apple has a different color and each color (except for red, which is the top for all) is desired differently by each character. 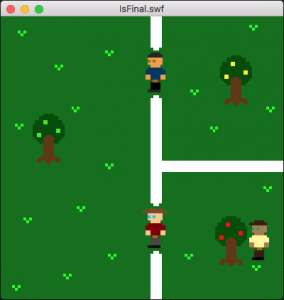 User: Can interact directly with the world by taking, giving, throwing(apples), or talking(NPCs). His desire for the red apple is the driving force of the storyworld and of the interactions in it. NPC #1: Can be interacted with by the user or by NPC #2. Has desire for red apple. Has willingness to help, and anger. NPC #2: Can be interacted with by the user or by NPC #1. Has desire for red apple. Has willingness to help, and anger. Giving an apple of a desired color to an NPC will increase the NPC’s willingness to help by one point on a scale of 1-9. NPC #1 will help user throw apples at NPC #2 when willingness to help is at 9. NPC #2’s willingness to help is fixed at 1. Unless anger of both NPCs is at 9, then NPC #2’s willingness to help will go up to 9 to help NPC #1. Throwing an apple towards an NPC will increase the NPC’s anger by one point on a scale of 1-9. NPC #1 will throw apples at user if anger reaches 9 if NPC #2’s anger is already at 9. 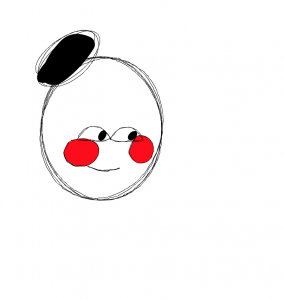 NPC #2 will move if anger reaches 9 and chase character whose apple got him to reach anger level 9. *Note: whichever of the two qualities reaches 9 first will autolock all other attributes and prevent them from increasing for the rest of the scenario. A list of the rules of the storyworld. Overall I was just told to make the impact of NPCs have more relationship to one another, rather than just having them react to the user alone. Also that the qualities of each charcter(willingness to help or anger) had to deliver different outcomes and not just necessarily be inversely dependent, so that I could have a character that is both angry and willing to help at the same time and still have different outcomes. For this project the artwork was an important part of the feeling I intended to evoke from this storyworld. I chose pixel art because it gives it a juvenile feel, and hence gives any outcome or result a comical feel to it. Also, it is easy on the eyes and allows for the users to connect to the characters, even if they have never seen them before. The aesthetic proved welcoming and easy to digest, as was my intention. The basic shapes and bright colors of the theme proved to be an appropriate aesthetic for the scenarios of the storyworld. 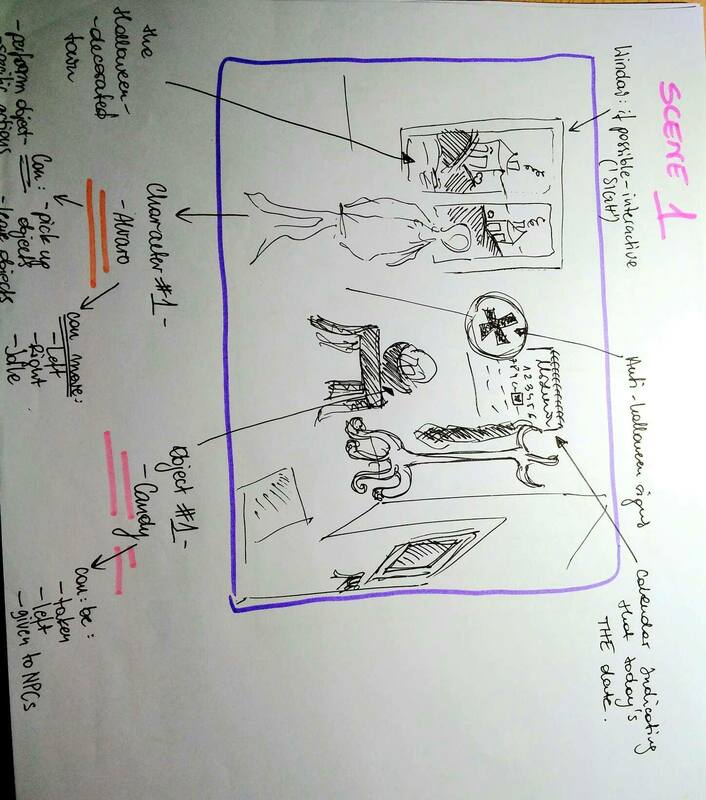 The desires for the characters were to be interpreted with simple icons through speech bubbles so as to give the user clear objectives and the desires of each character to propel the story forward. The finished project was nowhere near the finished product I had in mind. This was mostly due to my lack of skills in coding and knowledge of the animation programs. The artwork was all there, but the interactions and attributes were all lacking. There were no barriers established, so the user could walk off-screen, through objects, and could not interact with anything on the screens. 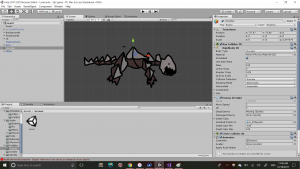 I managed to get the character moving and doing the animation of the interaction, which was he character with its arm extended. Other than that, I was not able to accomplish much. My main problem, as I discovered, was not that I could not understand the functions and the code, but that I lack the ability to formulate my own working code correctly. The main function that play-testing served for me was the solidification of my ideas with the storyworld in theory, rather than on the physical code. I believe that in theory my project could have proved promising and successful as a storyworld, sadly I am just not the right person to give it life. Interactive storytelling is a difficult topic to wrap your mind around. However, one thing I started to realize a bit too late was that interactive storytelling shares more commonalities with interactions and scenarios in the real world, rather than those you would expect to find in games or movies, which have predetermined outcomes, or mechanized interactions with few results. Games are meant to be as realistic and as close to real life as they can, but they lack the complexity that I believe an interactive storyworld aims to show or portray. A brief discussion of the process, particularly how the concept for the story world came about and took shape over the course of working on the project. I think the concept came about rather naturally because we were supposed to create a “2D interactive story world” I think my mind immediately fled to the realm of imagination. The countless hours of my childhood spent delving into the world of 2d games, Pacman, invaders, Mario, Pokemon, the 2D games on my Gameboy were some of my closest companions. Fondly remembering the days of running and exploring in a 2D space I wanted to create a story world that played like one of those classic 2D scrollers. As I continued to work on the project this idea was constantly evolving and growing, interaction was difficult, to say the least and aesthetics were hard to capture, over this long journey I think the idea became simpler and more refined and though each step was a challenge it was breathtaking to see this tiny little world slowly come to life. An overview of the concept of the story world, including a description of the theme and the objective. The theme of the story world is survival, playing as the character it is your goal to make it to the end alive, though coding an ending sequence was a bit difficult so for all intents and purposes making off the screen without being eaten could be considered a solid win in my book. Ideally, survival would have pertained to the other characters in the story as well, the other NPC runner and the monster, depending on your choices it would have changed who survived, you, the NPC, both, the monster, or all three, these were the multiple options that could have come out in relation to the choices made. 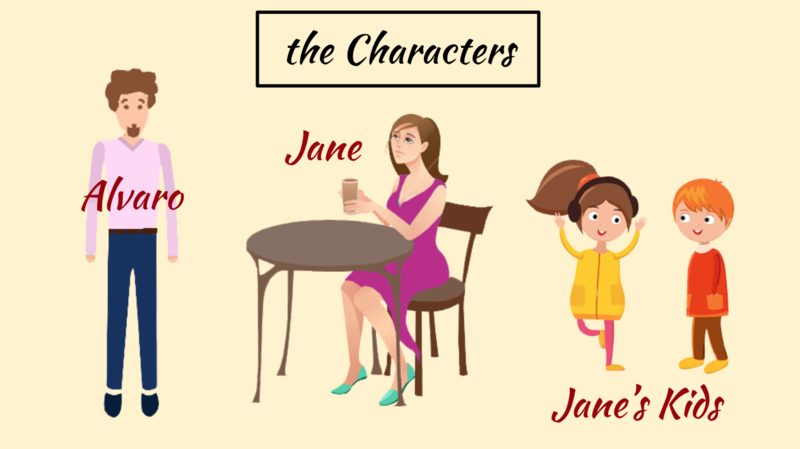 A brief background description: what is the setting, who are the characters, and what role does the user play. The setting is a cavern filled with fire, a forgotten mineshaft linked to something hellish and primeval. The characters are two miners, one the playable character and the other the NPC who runs alongside you, finally, the other character is the ferocious beast hellbent on devouring you whole and escaping to the surface. A description of how the experience begins and what constitutes a resolution or conclusion. The experience begins with you and the NPC dropped a few meters ahead of the monster, armed with little instruction, it is expected that you flounder and meet your doom. This increases replayability until the moment the player becomes a master of the inherent controls and is able to escape with their lives. Due to my limited coding abilities and recurring issues with coding C# scripts in Microsoft visual studio, there is no extremely obvious resolution or conclusion, but having your character escape off screen could be said to be the equivalent to you “escaping” through a popup will not be there to inform you of your victory. Ideally the other resolutions would would include the possible survival of the other NPC, or the death of yourself at the hands/for the sake of your fellow miner, though in a past iteration there was the capability of killing the beast and thus ensuring the survival of both parties as of this current moment that part of the story world is not working. A list of story world(game) objects and their properties. A list of actions/behaviors available within the story world and how these contribute to progression in the world. A list of the rules of the story world. A description of the user interface and actions (interactions) available to the user. The actions available are the movement of the NPC and the playable character, the death of the NPC and the character is firmly within the hands of the player, though their survival is currently limited to the playable character, the user is able to run away or towards the monster, to attempt to fight it, and to die trying. Letting the monster interact with the NPC by eating them results in more time for the playable character to escape with their lives intact. Unfortunately, I was not able to receive any feedback from the playtesting session as we never truly had an opportunity to play the other games, but the feedback I received from Professor Sarah Krom was essential in getting started and realizing the difficulty and complexing that was involved when creating a 2D interactive story world. Reflections on design choices for the system that integrated visual communication, narrativity, and interaction. I think there are a lot of things to be considered when dealing vidual communication, narrativity, and interaction. Working on this project you realize how much distance plays a role when trying to communicate different things, to interact with something often means that one has to physically touch the thing they are interacting with. And its incredibly easy to take that for granted, when coding an interactive story world on of the key things to learn is to use distance as the initiator in may changes of state, to simulate interaction is to have your characters come within a certain distance of each other before changing their innate states. Even then, simple changes in state can hold so much information and tell so much of the story. Tears, a frown, these are all indicative of sadness and the simply having a “physical” interaction and a change of state from a neutral smile to a frown instantaneously paints a picture of some kind of loss for the parties involved. Looking at my own project and reflecting I honestly wished I could do more, because a combination of simple steps could produce something infinitely more complicated and though the foundation for what I wanted to achieve is there is much more to done and to be added, there is so much life that has yet to be breathed into the works. The finished piece as I said before has the foundation for success, but sadly at this moment that is all it is, the foundation. The interaction is lacking and only a few of countless interactions and stories are able to be told in its current iteration. 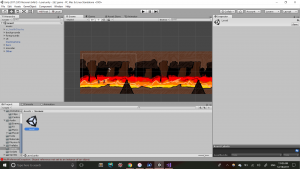 Having never really extensively worked with unity, animate, c#, animation, or Photoshop (its been a few years), let alone a drawing pad, the project was an intense and daunting beast comparable to the one in my story world. Thus the process of working from the ground up was especially challenging especially when I discombobulated myself so much by focusing on the aesthetic and the visuals of the project rather than the storytelling and interaction. It was terrifying to create sprite sheets, to create animations, to aim to be so perfect in the tiniest of details that I was completely blindsided by the larger and more important aspects of what a story world was supposed to be. Assessing the finished piece, I am happy that I got to learn and interact with so many things, programs I had not before, but I am largely unsatisfied with what I have accomplished so far. I will continue to work on the project until I at least get the basics down and forever take this experience as a lesson and a memorable first step into a world that I’ve ever so eagerly wanted to join never simply never had the know-how, the stepping stone, or the courage to join. Any additional insights on the process, the project or the domain of interactive storytelling. There is so much to learn in the domain of interactive storytelling. As I said before it was pretty daunting to suddenly dive into this world full of things I had never truly worked with before, and because it was difficult to see exactly where to start I found myself getting sidetracked by things that were not so important in the long run. It was difficult to find a proper scope and to realize what was too much to bite off and what was too little. I think if I had other, previous examples of what exactly we were supposed to shoot for I think that would have had a better starting point in regard to knowing what to shoot for. But as a whole, it was utterly amazing and thought-to provoke while sometimes challenging to think of interaction and storytelling in a completely different way, to think outside so many different boxes and comfort zones. I knew from the beginning that for the final project, I would want to build on a previous project as opposed to coming up with a new idea from scratch mainly because I would like to see what the project is like had I taken into account the things I have missed out on the first time. I then decided to work on the first final project. The theme for the first project and this final project was friendship. However, the first project focused on the character’s entire day of her weekend while this project highlights a ‘slice’ of that day, i.e. when they’re out at a coffeeshop. There are two characters in the storyworld, i.e. Sarah (NPC) and Kerri (the user). Sarah just recently went through a break up and in need of support during this rough time, so she naturally turns to her best friend, Kerri. However, sometimes there will be distractions or events in real life that occurs as we’re trying to comfort a friend, for instance when Kerri tries to comfort Sarah. The objective is then for the user, playing as Kerri, to comfort Sarah, despite the distractions/events that happens around them at that moment. The experience begins when the user clicks on the screen and Sarah starts telling the first part of her story. Afterwards, the user is presented with two options of possible actions that would make Sarah feel either better or worse. Sarah’s feeling will be conveyed through her facial expression. In this storyworld, Sarah will be telling 3 stories and after each story, the user will be presented with two options to choose from. At the end of the final story, the user will find out if their choices of actions had made Sarah feel better or not by looking at her facial expression (is it a frown or is it a smile). There are two characters in this storyworld and the user can control the action of one of them, which will indirectly influence how the NPC feels. This is done by clicking options that’ll hover above the user’s character’s head. contribute to progression in the world (these are likely to be a combination of actions/properties that combine to form a behavior). Each option will contribute to the Happy Point and Sad Point variables. Comforting/supportive choices will add +1 to the Happy Point while not-so-comforting choices adds -1 to the Sad Point variable. At the end of the experience, if the user garners more than +2 Happy Points, Sarah will smile and thank you for being a good friend. Otherwise, she’ll frown a little but still thank you for your time. She’ll also apologise for wasting your time because she felt like you were there just because you feel obligated to be there. Sarah is sharing with Kerri that she just recently broke up with her boyfriend. As she was telling her story, Kerri’s mobile rings. It turns out that Kerri’s mum is calling her. Would you, Kerri, answer the phone or carry on listening to Sarah’s story? She goes on to tell Kerri that although she hates being alone, she feels like it’s meant to be because she never loves her anyway. She then goes on to say that perhaps, it was indeed a good decision to call quits when her ex-boyfriend gives you a call. 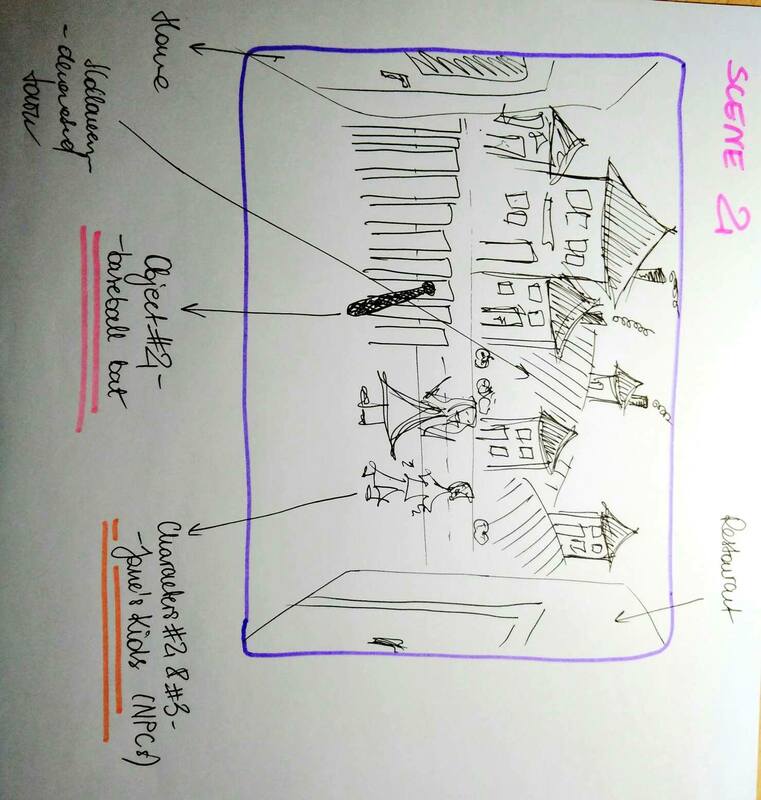 However, from this final project’s playtest session, the major feedback I received was that the story I chose was hard to be depicted through visuals only without texts. Moreover, at the moment, the story seems one dimensional in a sense that it needs to go beyond a cause-and-effect thing. At the moment, looking back, it is hard to create that with just one NPC. Although initially Prof agreed that the many possible actions should make it a bit okay to just have one NPC, we both found out that it still leaves the storyworld feeling rather one-dimensional. I started planning out my interactive storyworld, keeping in mind that I would ideally have 3 characters present in the story. As usually, I thought that dating/love story could be interesting ans definitely provided much room for creativity for me. Over the course of approximately two weeks, when I was building, drawing and planning out my storyworld, the core of my story always remained the same, even though numerous aspects and details of the world were a subject to constant change. In my story, Alvaro, the main character and the only one we can control, is about to go on a date with Jane. Alvaro starts his experience in his house, where we find multiple objects, for instance, a calendar where he marked the date, a table, on top of which there is a beautifully wrapped basket with sweets. 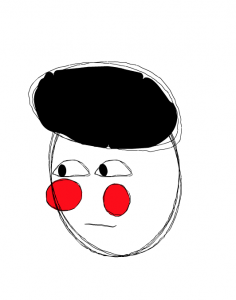 However, on that particular day there is also Halloween taking place – a holiday that Alvaro truly despises and does not see the point of. We learn that by looking at the view outside his window, of a Halloween-decorated town. Moreover, there are anti-Halloween protest signs in Alvaro’s room, indicating that he is not the greatest of fans of the holiday. 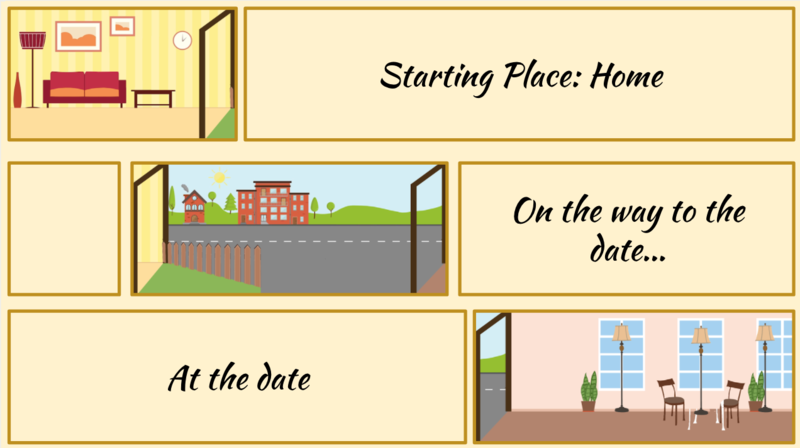 The next location that the user of the storyworld, as Alvaro, can walk to is the yard of Alvaro’s house and the outside on his way to his date. 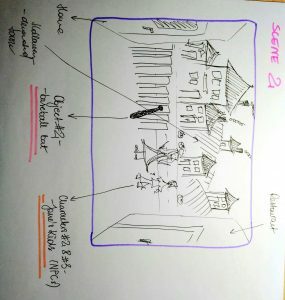 After leaving the house, we enter the second scene, where we see more of the Halloween-celebrating town, a baseball bat that Alvaro keeps outside his house, and a boy and a girl, who are the characters #2 and #3 in our story. 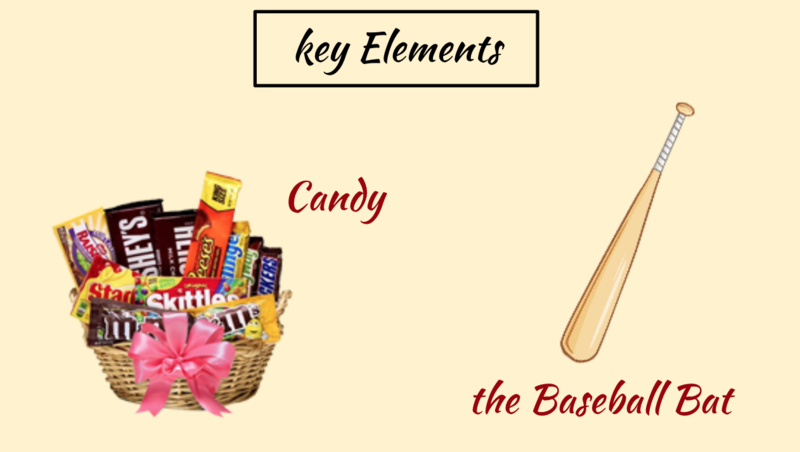 As the user enters the second scene, the children are already there, jumping and requesting candy, which opens 3 different action options to the user: to ignore the kids, and walk by, to scare them with the bat, or to give them the candy that was meant for Jane. Of course, at any point in the story we are free to walk back and forth and interact with the objects. Once we, as Alvaro, are outside, we have the freedom to progress to another location – the restaurant where we are supposed to meet with Jane. After interacting with her, her children come and behave accordingly to the way the user previously treated them, which has a large impact on how Jane will like Alvaro. The interaction with Jane is something that we cannot reverse. Just as in real life, once we have interacted with people, we cannot undo it and erase their impressions of us, which is why I decided to make every choice in interactions with NPCs have irreversible effects on the story. 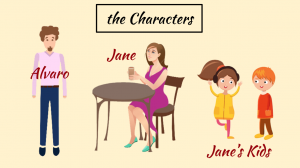 Depending on how we treat Jane, and how we have treated the boy and the girl, who at that moment turn out to be her children, the date may have varying outcomes. The rules of my storyworld are very simple. There is a limited number of actions that we may perform. The user, as Alvaro, has the freedom to walk around, interact with the objects available without any limitations. The main rule is that the storyworld, as I have previously mentioned, allows for interactions with NPCs that have irreversible effects. Once made impression does not vanish. For instance, if we scare away the kids with the bat, and later try to give them candy, it will not have the same result as if we had only given them the candy. 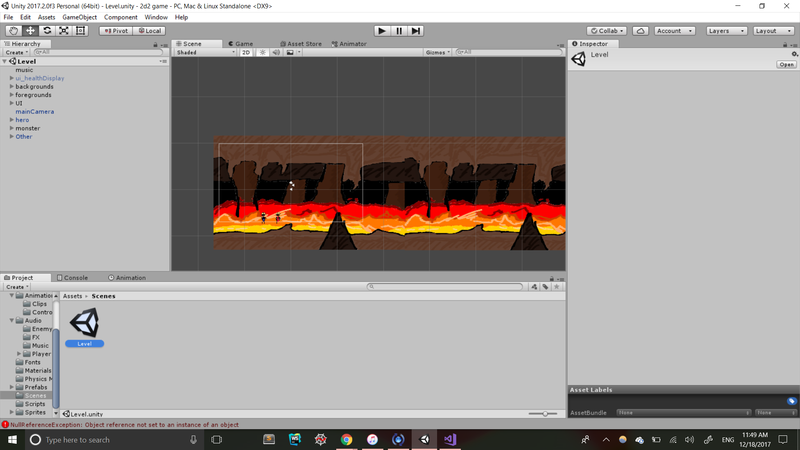 Even though, as far as programming and creating my storyworld goes, I did not manage to implement a score system, but ideally it would be present in my storyworld. For instance, if scared by Alvaro with his bat, the children would lose 15 ‘happiness‘ points, if given candy, they would gain 10 of the same points. That system would create a hierarchy of priorities in terms of character needs and desires. Essentially, that would indicate that the children appreciate safety more than the candy they are asking for, and once Alvaro has scared them, he cannot undo it or make it up to them. The other storyworld rule is that we may hold only one object at a time. the following actions may take place only once. Even if the user, for instance, decides to go straight to Jane and not interact with the Kids, that action will count as previously mentioned ‘ignore’ action. Ideally, the user interface of my storyworld would be as simple as possible. In the very beginning of the experience, before we even enter the world, the user would be given a few simple instructions on 1. how to navigate the world – by arrows or wasd, 2. How to interact with objects and other characters – by clicking on glowing objects/NPCs, 3. That it is possible to hold only one object at a time. All the happiness points that the children have in the end are also calculated into Jane’s score. For instance, if as Alvaro, we decide to scare the kids with the bat (kids -15), but later we give Jane candy (Jane +5), the end result will still be negative. Based on that score system, the date can go well, ok, weird, or horrible. Well happens when Jane’s final score is 5 or above. OK happens when Jane’s final score is 0. Weird takes place if Jane’s final score is -5, and horrible when it is -10 or less. The main suggestion I have received during my playtest session was that, even though my storyline is branching out, it still gives off quite a linear impression. I have considered it and if I were to create this story again from the very beginning, I would try to avoid the linear impression by adding more interaction options, but most importantly – by ‘opening’ the endings. Instead of the ‘one interaction per NPC’, I would allow the user to go back to the other characters, thus keep the story going and more open-ended. I started with an idea of making another love-story, as I mentioned before. I sketched everything out – the characters, objects, environment, locations, as I believe having everything planned out helps a lot when working on complex projects. Next, I worked on my assets – photoshopping images, drawing, adjusting them to the needs of Animate CC (like deleting backgrounds etc.). 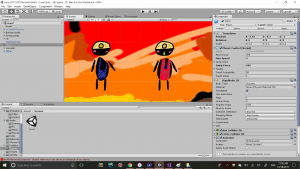 My next stage was importing the files into Animate which is where the process became significantly complicated as it was my first encounter with both Adobe Animate, as well as ActionScript 3. 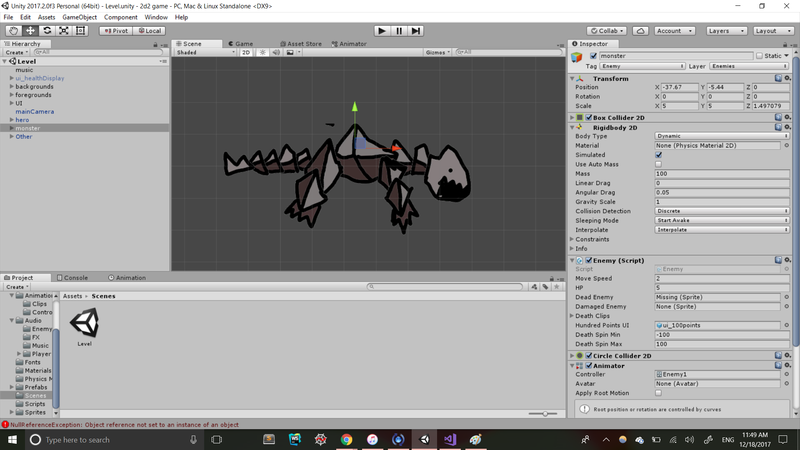 In the end, by creating a series of images of the main character, I managed to create a walk cycle and animate it, even though I came across multiple obstacles while doing so. As much as I am quite satisfied with my walk cycle, I did not manage to make the ‘walk to the left’ animation for Alvaro which, as a result, looks like he ‘moonwalks’ whenever the user presses the left key. Coding was certainly the most challenging part of this project for me. As all of the locations in my story are connected, initially, I wanted to make a camera that would be attached to the character. Whenever we would press a right or left key, the camera would move accordingly, and the character would stay in the middle of it just playing the walk animation. However, the version of Animate CC that I worked on did not have the ‘Camera’ object in it, which is why I ended up moving the entire background. The first problem that I faced was that all the objects in the world would not move along with the background, so I attached them to it. Therefore, when moving the background, the user automatically moves everything else along with it. Overall, I am very satisfied with my interactive storyworld. I believe that it went a long way to be where it is right now. Initially, I could exactly grasp the idea of ‘interactive stories’, however, working on this final project helped me understand the idea. The largest problem that I faced was programming. Not because I could not properly program my interactive story, but because I initially created all elements of my story and my storyworld thinking whether I would be able to program it, which at some point turned out to be very limiting my creativity and options that the world would provide. 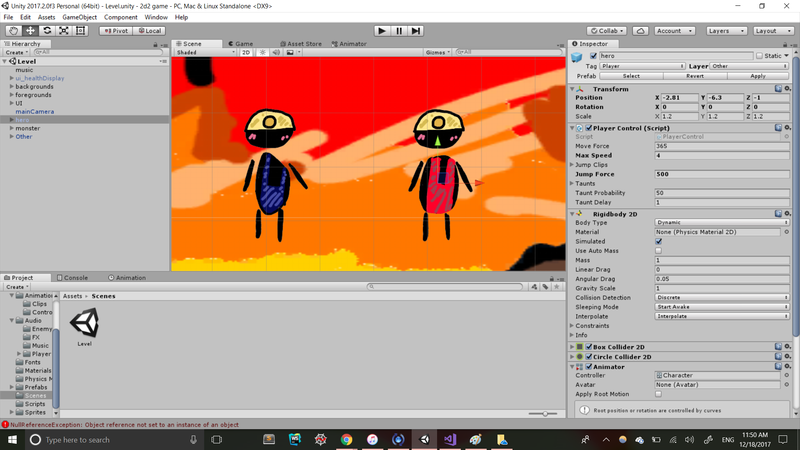 As for the process of creating the storyworld in Adobe Animate, creating the assets, trying to program the system, I found it quite challenging. Creating the assets was very time-absorbing, but certainly the easiest part of my work on this project. In terms of working in Adobe Animate, at some point I regretted not using Unity 3D because of the amount of resources available for the latter. Moreover, having a very broad experience in Adobe After Effects, I initially assumed that the interface and functions would be very similar, but in fact I found them very different. Certainly the hardest part of my workload was the programming. 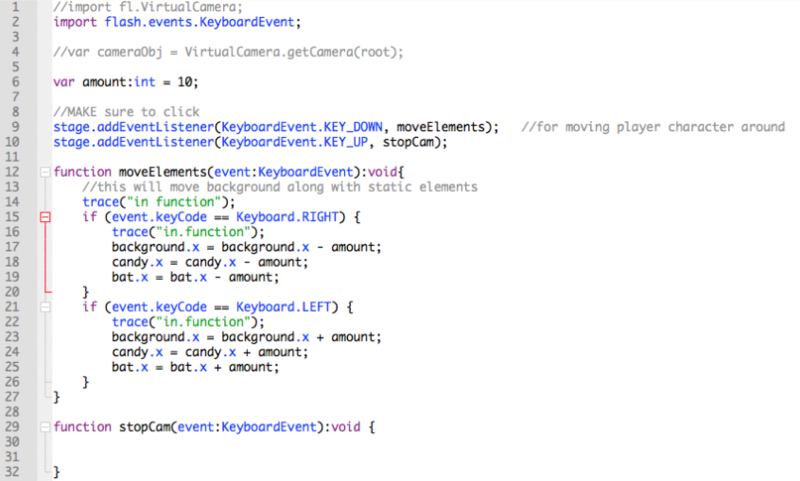 Spending hours researching ActionScript 3 online, trying to program the storyworld, turned out to be quite futile. I believe that I learnt a lot through working on this interactive storyworld. Not just in terms of the software that I used, but mostly in terms of making my story interactive and understanding why it is not a game, but a playable story. A brief discussion of the process, particularly how the concept for the storyworld came about and took shape over the course of working on the project. For my final project, I wanted to develop my theme from the second project, not only because I felt there was a lot I could potentially work with in terms of creating the interactive storyworld, but also because the setting, theme and characters fit with my idea of creating an old-school style story. By old-school I mean the pixelated characters that are reminiscent of early video games, which also fits well with the theme of childhood. Therefore, my storyworld conveys a child-esque abstraction, where the user is hopefully immersed in a simple world where two children who want to eat and enjoy their ice cream may also come into conflict, because they are children after all and that means that one may want what the other one has. This is the case for the girl, who after dropping her ice cream and seeing that the boy has his ice cream, gets upset and takes his ice cream when he approaches her. An overview of the concept for the storyworld, including a description of the theme and the objective. That leads to a discussion of the theme. As previously mentioned, I chose childhood as my main theme, because I wanted to explore the way in which children interact with one another, be it interactions between friends, schoolmates, or strangers who may meet at the park or at the playground. I’ve placed my characters at a park, where there is an ice cream stand. I feel that colorful ice cream cones and children go together well, so I chose to make the interactions within the storyworld revolve around the ice cream, which becomes a valuable asset. The objective of this game, then, is to share an experience, whether that experience involves orchestrating a friendly moment or not. Some questions surrounding the objective include: What should be done after the girl has dropped her ice cream and is very upset? Should the boy (controlled by the user) approach her? As mentioned, the story takes place at a park, where there is an ice cream stand. There are three characters: the ice cream man, the girl, and the boy. The user plays the role of the boy, which is to walk around the setting and interact with the other two characters. 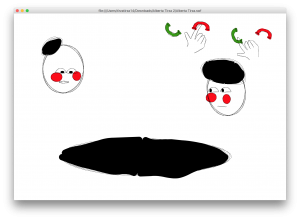 The experience begins with a basic instructions page (see Video 1), where the user is told that in order for the boy to begin his interaction, the user must first click on the girl to watch her drop her ice cream and become upset (see Image 5). The user is also told that in order to move the boy, the user can use the keyboard arrows, as well as the spacebar to have him eat his ice cream. After the girl’s animation has played, the user is able to move the boy around, and has time to explore the setting. If the user goes to the ice cream man first, there will be no interaction available, since the boy still has his ice cream. If the user goes to the girl first, then the girl, who is very upset at her dropped ice cream and jealous of the boy for having his ice cream, will take his cone from him and eat it. The boy will then have no ice cream and be able to go back to the ice cream stand to buy another one. After the boy has bought his ice cream, he can eat it and choose to walk around again, without losing his ice cream a second time. This is what I have so far, but ideally, the boy would be able to take back his ice cream from the girl, or potentially drop his ice cream after he has bought it, which could either trigger a positive reaction from the girl, who could then feel bad and give him back his ice cream, or have him be able to purchase yet another one or again, take back his ice cream from the girl. Another option would be for the boy to give his ice cream to the girl in solidarity. However, due to a lack of coding abilities, these options were not included in the playable version that I presented, but I wish they had been. A list of storyworld(game) objects and their properties. A list of actions/behaviors available within the storyworld and how these contribute to progression in the world. buy another ice cream, after the girl has taken the boy’s ice cream, making the boy become happy again (as seen by his change in facial expression from sad to happy). The actions available to the user have previously been touched upon, but to reiterate, they are: walk around the park, not approach the characters, approach the characters, eat ice cream, buy ice cream, and potentially take ice cream, drop ice cream, and give ice cream. 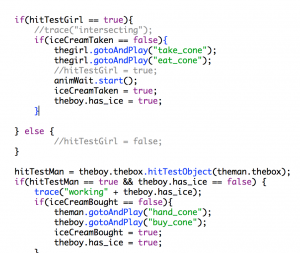 By being able to give the girl ice cream after she has dropped hers, for example, the player action supports the objective of interacting with the girl and potentially orchestrating a friendly moment. As of now, if the user approaches her, she will be bold enough to take his ice cream, which will orchestrate a non-friendly interaction between the two characters. These all relate to the theme of childhood, and the previously mentioned idea that children often want to take what their friends or what other children around them have, especially if the other child has something they don’t have. In this story, dropping an ice cream becomes a major deal, because they are children, and something like an ice cream have greater significance to children than they would to an adult. Although there was no play-test session, I will discuss the times I met with you and got feedback. 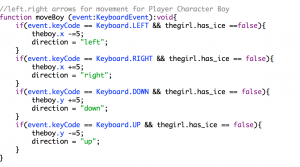 One of the things you mentioned was to make sure I set variables such as “has_ice” for both the girl and the boy, which I initially didn’t have. Setting this variable was crucial because it allowed me to use it in several different functions and it worked to my advantage in terms of getting a bit more interaction from the minimal coding experience that I have. Other small details that did make a difference in the end were things such as: making sure the fallen ice cream didn’t disappear once a different girl animation played, positioning characters further away from each other to allow the user to have some more room to move around, adding boxes around the characters in order for the functions to work, and adding an initial instructions page so that the user is not thrown into the scene without knowing what to do or how to move the character. These were all very helpful. Reflections on design choices for the system that integrated visual communication, narrativity and interaction. I wanted to make my story visually simple and also old-school, which is why I chose to create pixelated characters on Photoshop. To learn how to do that, I went on Youtube and looked at many different video tutorials and also got help from the IMA fellows. On Photoshop, I then added animations to the timeline (see Image 7 above) and individually imported each panel as a png sprite and imported those on Animate in order to create the different action sequences for each character. 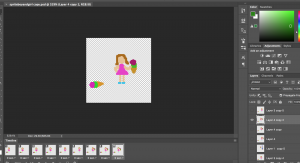 So far, I have simple design choices in terms of interaction, where the user can click on the girl to start her initial animation, use the arrow keys to move the boy around, and press spacebar to have the boy eat his ice cream. Again, given my minimal coding abilities, I was able to get at least these three things to work. 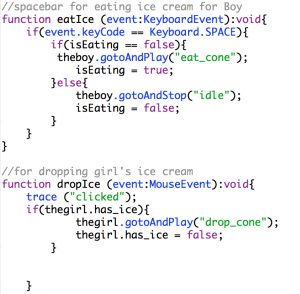 Potentially, however, the boy would be able to click on the girl after she taken his ice cream and take it back, or the user could press another key to give the girl ice cream. But these simple commands do seem to generate some meaningful interactions between characters, especially after the girl takes his ice cream, which, again, reinforces the theme of childhood and how children often take what isn’t theirs with no hesitation. Another function I’ve added is the timer (see Video 1, Image 6 above) for when the girl takes his ice cream. There is a short delay where the boy goes from being happy to sad and not having ice cream anymore. This taps into another important aspect of visual communication that adds to narrativity: the characters’ facial expressions. I made sure to add different expressions for the different animations, especially because we did spend a lot of time throughout the semester talking about how facial expressions can convey a lot of meaning in visual storytelling. The girl goes from smiling to being shocked to crying after dropping her ice cream and then back to happy after she has taken the boy’s ice cream. The boy goes from happy eating his ice cream to sad after the girl takes it, to happy again after he buys another ice cream. These are minor details that the user may not even notice but important details that reveal a lot about how characters feel after different kinds of interaction. Taking this class was very significant to me because previously I had always focused more on storytelling that is heavier on text and spoken word. I write fiction and poetry, so words are ingrained in my perception of storytelling. Therefore, taking interactive storytelling shifted my perspective, and although challenging to me, felt very helpful. And I guess visual storytelling without words is not only challenging to me, but overall very challenging, because it takes into consideration every little detail that needs to be included within the storyworld in order for the audience/user to comprehend what’s being told and to be immersed in the storyworld. 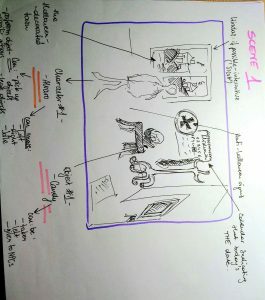 In a visual storyworld, there is no text or sound to work as crutches to the audience/user, so understanding every little component of storytelling is important; from visual facial cues, to symbols, to abstractions, to representation, to mise-en-scene, to character placement and body movement, to character interactions, to values, to objectives, and more. The interactive experience I decided to analyze was the tutorial portion of the online game: The Elder Scrolls Online. The premise of the tutorial is that you have just finished creating your character and customizing its race and class. The situation is that you find yourself a prisoner in shabby clothing, waking up in a locked cell with someone opening it from the outside, freeing you. Now freed, you are trapped inside of a larger prison complex and it is now your job to find your way out. The overarching goal for the user here is to learn the basics of the game, to learn how to control the playable character as well how to interact with the world around you. The main goal is to yes escape the prison, but in the process, the user is expected to learn how to walk, run, fight, and loot. The viewpoint of the experience can range between first person and various points of the third person, if you so choose the user has the capability to play as if looking through the eyes of their character, this choice is characterized by the only two visible characteristics of the character being their two hands, showing the weapon, shield, or spell that the character is currently using. Otherwise, the user may choose to play in a third person perspective with the camera trailing behind them. Here, the user is able to see the entirety of their character able to watch them move back and for, roll, attack, and interact with the world around them to the fullest extent. The actions available here are to move, forward with W, backward with S, and left and right with A and D respectively. This movement is limited to walk and swimming, but upon holding down the left SHIFT button said movement could be increased to a sprint. The SPACE bar is used to jump around and double tapping on any of the movement keys (WASD) allows the character to roll in the specified direction. There are a number of interactive items within the world such as bodies, containers, and doors with can be interacted with through the use of the E key, typical interactions include looting containers or bodies for their treasures or opening doors to other areas, here the R key has the role of taking all the items in the selection rather than accepting them one by one. As in other games of its kind, pressing the I button opens the in-game menu where things such as inventory, skill list, or the character equipment screen can be accessed. M is used to call up a map of the world and the ESC-ape key can be used to access the non-game-world menu where the user can either change the settings of the world or to log-out. Finally, the keys 1-4 are reserved for binding various skills that may be used in order to face the variety of opponents that exist within the world and the LEFT CLICK of the mouse is used to wield your mighty weapon while the RIGHT CLICK is reserved for putting up your guard and defending. Within the anatomy of the choice, we can narrow it down to interactions within the tutorial. The options to the choices are not entirely open to the user. At times the user may be able to loot or not to loot an object, to fight or not to fight an opponent, but in relation to the over-arching story, the user has no say in the large events they must accomplish. The story is quite linear and should the character choose to ignore or deviate from the path then I suppose the game would simply come to an end. In regards to the decision to fight something, before that moment you understand that if you fight you get stronger if you fight you have the possibility of gaining strength and riches. Before this moment, you know that monsters will not hesitate to kill you should you stay and thus your decision is imperative in deciding your life and death. The possibility of a choice is conveyed in that, if it is not a larger story-needed boss, you have the choice to not fight them, you can simply ignore them and try to find an alternative path, or to run through them and hope that they will not strike you down, both not necessarily obvious or encouraged within the system, but the choice is ever present. The player makes the choice by doing it, they are in full control of their character as they choose to run or not to run, to fight or not to fight. Within the larger scheme of things, this choice doesn’t actively have an impact on the world, but it might in the sense that if you do not make the choice to fight, you may miss the experience needed to get stronger or perhaps you might miss an item that you really needed, either way, the decision to fight or not fight an opponent could have a minor butterfly effect in which you are simply not prepared for the events that lie ahead. This in and of itself could change the choices of the future, because in the instance that the user is defeated by a stronger foe, they might be conditioned to not attempt to combat foes they do not feel capable of defeating. This is similar to the slippery slope effect, where one defeat leads to another until the user is eventually unable to enjoy the game and its challenges. The designed choices support the goals because the goal of the game is to get stronger and/or richer, by choosing to fight the user gains the ability to gain both. In fact, much of the game is centered around this idea of fighting, killing, and getting stronger, for only through gaining experience do you gain access to the flashy and magic-like skills and often times these skills may only be utilized on the field of battle. By collecting items, the character is able to amass wealth, brew potions, craft items thus increasing their strength even more in essence creating a feedback loop where the main goal is getting stronger and stronger to take on the challenges ahead. All of this begins with the choice to fight, it would not be a stretch to say that only by making the conscious decision to take up the blade, or spell, would the user truly be able to appreciate all the beauty and fun that The Elder Scrolls Online has to offer. The qualities ascribed to the user experience brought by the interaction are a sense of growth, fulfillment, and excitement. Through the painstaking process of creating an avatar the user is drawn deeper into this mystical world, the character they create has been handmade by their own choices and so are intrinsically a closer part of them. As their avatar continues to journey continues to see more of this fantasy world a sense of growth is ever present, able to take on challenges that they were previously incapable of, and able to use an ability gained through countless efforts. In this same way, the user is able to experience a feeling of fulfillment, in an MMORPG the effort put in often shows itself in the results that come out, fighting has a direct effect on leveling and getting stronger and harvesting resources have a direct effect on creating items that the user desires. In terms of excitement, it is the thrill of interacting with an entirely new world, in reality traveling to a foreign land is a process both long, exhausting, and expensive, but in the world of the game, traveling is only limited by your determination to move from point A to point B, though it has the potential to be equally long and grueling that point comes much later in the journey and by then, the distance traveled in the game would be countless times larger than one traveled in the real world for a similar price. To exist in a world of magic, battle, danger, and reward is to relive the romanticized days of knights and samurais, of traveling heroes completing quests and fighting beasts, while at the same time enjoying the amenities of the modern world. To play TESO is to delve into a realm of possibility and experience a reality like a user may never have before. In hindsight, it is more apt to realize that TESO is almost the opposite of what we were truly supposed to analyze for this class. A remnant of days old and yet still tragically relevant, TESO is a perfect example of a world without a fluid story, where the user is simply given the illusion of choice. In reality, the user is given a series of predetermined quests with their own predetermined conditions, and though you are given the option to technically complete the objectives as you wish, in the end, you must still complete the objectives in order to complete the quest, if not you simply choose to fail. This idea is even more impactful in the tutorial I played through, in the play through you must absolutely play by the rules of the game and complete the objectives. Otherwise, that is no form of progression, you who chooses no is doomed to spend eternity wandering around the tutorial space, never allowed to see the world beyond. Every choice is predetermined and unchangeable, therefore though the game gives you the ability to play the type of character you want, wield the powers you choose, in the end, that choice has no effect on the outcome of the quest. The choices you make are only meaningful in the sense of immersion and character progression, choosing to not complete a quest is to simply be unaware of a minor fragment of a larger, massive experience, helping Jane or Joe on the street has no, and will never have any sort of ripple effect that would drastically change the story, unless it has already been predetermined by the coder gods above and in reality, a singular quest is simply one of the hundreds that you complete as you slowly grind your character from lv 1 to 100. TESO like many MMORPGs today is adept at giving the illusion of choice, yet the main point is that the end result does not change, the player can never escape the almost binary choices given to them, they may find unique and interesting methods of completion that have never been seen before, but ultimately their choices will end with a result no different and no better than the ones that came before them, though you are the protagonist of your own story, your choices and your existence, largely have no true impact on the world in which you exist. Witcher 3 is known to be one of the most successful recent video games. It is a 3rd person role-playing game. Upon its launch, it surprised the players with the multitude of options and how much of the storyline relies on player’s particular choices, actions, or even lack of action. For the sake of this analysis, I decided to focus on an episode that is quite significant to the entire storyline. In the Witcher’s war-ridden universe, Geralt, the protagonist, encounters his past love – Triss. The woman asks him for help with smuggling persecuted mages, herself included, out of the city of Novigrad. Based on this request is an entire quest called Now or Never, which involves countless decisions that we, as Geralt, need to make – whether to save the mages or refuse to, try to save Triss’ friends or focus on all mages, express feelings for the sorceress and ask her to stay or let her escape with others. However, I do not intend to focus on any of these specific decisions, but rather on the overall decision whether to take up and complete the quest or not. The creators made a very smart move by excluding Now or Never from the main storyline. As it is merely a side quest, it was expected that numerous players would not bother completing it for the sake of focusing on the main story. However, it turns out that whether we decide to take up the task or not, has a large, but underestimated effect, on the ending of the whole game. The entire anatomy of the choice is very subtle therefore, it is exceptionally easy for the player not to pay attention to some of the choices that they make. Moreover, depending on how we approach the quest, we might have much more than 2 outcomes: the mages might be saved, or might die, Geralt might end up romancing Triss at the end of the game, or not, etc. Moreover, depending on the outcome of our decision whether to take up the task or not, even more decision options open up for us. Given that Geralt fully aids in the escape of the mages, new quests appear, where we might decide the fate of the ‘Lodge of Sorcerers’ and Redania’s King, Radovid. I believe that the questline designers did a brilliant job camouflaging this specific choice in a way where players might even not realize that they are choosing anything, as in the opposite to most choices we make, we are not given option A, option B, etc. Instead, we are assigned a side quest that we might decide to follow, or ignore. In terms of the interface, the creators of the Witcher saga did a good job minimizing the amount of screen covered by interface elements. Decision-making is usually based on dialogue choices, that also have low opacity and cover as little of the screen as possible, which is how we choose to take up the task and help Triss or not. For this particular analysis of a narrative I chose to close in on a sequence from a game called Life is Strange: Before the Storm. This sequence occurs in episode one, of three, towards the beginning of the game. The game is about a girl named Chloe Price, who lives in a small town, and her life up until this point has been met with nothing but misfortune and misery. From her father being killed in a car crash, her best and only friend leaving her behind to move away to Seattle with her parents, to her own mother turning her back on her and getting a new boyfriend so shortly after the passing of her father. Currently, she faces loneliness, and constantly wonders why things in her life are always going so wrong. In response to her surroundings, Chloe has taken a difficult attitude, with disregard for authority and consequence, and simply has taken to doing as she pleases, which in turn, has made her situation even more difficult to handle for those around her. In the selected sequence, Chloe has recently met a girl, who also happens to be the most popular, well-regarded, and upstanding individual at her school. The two formed an unlikely bond over an experience that drove them together the previous night. In the sequence, the two have met again the following day at school to discuss the events of the previous night. In the cutscene, the girl is finishing up a rehearsal for the school play that is soon to take place, and is conversing with her teacher and fellow actors, at one point asking for Chloe’s opinion, who is just standing by awkwardly. The two are in the school’s theater class and changing room. While the girl, whose name is Rachel Amber, goes to the back to change, she asks Chloe to get her belt from her bag, which is at the other end or the classroom from where the changing room is. Here, the player controls Chloe’s actions, though we do not control her thoughts, and we are able to hear them, based of the objectives, or on the objects in the world that we are able to interact with. Once the cutscene has ended, the player has the freedom to explore the room, and the many objects in it, or to simply do as asked and move the story along more quickly. The setting itself is a theater classroom inside a school. It is relatively small with many obstacles to maneuver around, making the room seem bigger than it actually is. As stated earlier, the main goal of this sequence is to acquire Rachel’s belt and deliver it to her. The viewpoint of the sequence is a third person point of view with an overhead view of Chloe and everything in her near proximity. The objects in the scene that Chloe/the user can interact with are outlined in animated chalk-like lines that cover the object. If standing out of reach, the name of the object will pop up. If close enough to interact with it, the object will display the ways in which Chloe can interact with said object. Normally, there is only the option of looking at the object, which triggers internal dialogue of Chloe’s, which gives the player further insight into Chloe’s thoughts and into her life. The options to a choice in the interaction with an object vary between objects. Or the purposes of this exercise we will focus simply on the choice of getting the belt from Rachel’s bag. Upon being close enough to the bag, the user can interact with it and it will prompt two choices: Look, and Grab Belt. The unspoken third choice is to back away and continue exploring the room. The third choice gives way to many more options of interactions like this one, but with only the choice of looking, mind for one or two other interactions. Each movement across the room is what leads up to being able to interact with each item across the scene. After prompting the object to make a choice with, by selecting the object by clicking the mouse while staring at the object, the user can then choose “w” “a” “s” “d” to pick an option, based on the choices available with that object. The reason we know the option is available is because it is visible. In the case of the choice of grabbing the belt, choosing this option prompts a short cutscene where Chloe looks through Rachel’s bag for a bit. During this, she finds a photo of Rachel and her father when Rachel was younger. In this case, the choice made helps continue along the plot and provides context for the rest of the story that is yet to come. This is one of the choices in the game that simply allows the player to continue along in the storyline, that, unlike many other choices in this game, don’t really have any altering consequences in the game. The design choices definitely support the theme of the game that is that choices matter, whether you want them to or not, and that sometimes choices are made that have consequences whether that was our intention or not. In this game, the player makes choices based on what they know about Chloe’s life to impact the things around her differently. But at the end of the day, it is Chloe who is making the choices on how she does things, whether it is what the user intended or not. All throughout the game, we are simply playing through a chapter in Chloe’s life, and although the point of the game is to place us in someone else’s shoes, ultimately we are still just observers over the events that happen in the story that is being told. I think that the way in which the individual choices of interaction with an object, for most objects, is representative of the game overall. Since most choices are simply to “look”, we are truly able to see a story that is not our own through the eyes of Chloe while she steps through her life and her own adventures. The qualities that definitely belong to the interface that are reflected in the game are the choice making systems. The whole idea of looking around is attributed to moving around the mouse, and interacting with objects to clicking the mouse. The letters with which a choice is selected when an object is interacted with are the same the are used to move, which allows for a feeling that when there is a choice to be made, the user can’t just be walking about, distracted. The repeated usage of the WASD keys also make it more accessible to play the game altogether, because it prevents the player from being distracted by many other buttons and keys of the interface. Another feature that was very helpful was the “objective tracker”. If the player holds down the right mouse button, Chloe will look at her hand, where her objective has been scribbled onto it. This helps keep a focus on the goals of the game, and the player on track. All of this, in turn, contribute to the linear style of the game, to help get to the point and though the experience of Chloe’s life.